Anyone who knows me well, will know that I am a bit of a handbag obsessive, so I am not quite sure why it’s taken me so long to actually to do a post about one! I have certain ground rules with bags. 1. I don’t do fake leather bags…it has to be leather or nothing. Don’t get me wrong, I do like a good canvas bag. But the sort I like is the sort that makes no pretensions of being anything other than a canvas bag. I do not like bags that claim to be leather and are in fact poor pvc/faux leather imitations. There is something about the smell and feel of leather…the natural creasing and softening that you get with age, and that I just love. 2. I like my bags to be generally under £100 or thereabouts. I know it may seem an impossible task, but it is actually possible to get a good leather bag for under this amount. Good places to start are TK Maxx (brilliant handbag selection that is constantly updated and changed) and high street chains such as Zara, Mango and Top Shop. Top Shop in particular currently has a brilliant selection of handbags in its Oxford Circus branch. Well worth a visit. 3. I do not on the whole buy high end designer ‘it’ bags; partly because I believe the price tags to be completely obscene and out of proportion to be the item you are actually buying (in fact the more of us that that boycott these prices the better: no single handbag is worth £1000, no matter how good the leather); partly because I am just too fickle about bags (I tend to go off them after about a month), and partly because I remember a time (when I first moved to London) that I used to pay £525 in rent, so I refuse to buy a handbag for the same amount of money on priciple. 4. I do not buy any bags covered in monograms. No more shall be said, but I think you all know the brand I am talking. I’ve had a quite a few comments on this bag since using it. It’s one I first spotted in Mango in Palma during our summer holidays, but stopped myself from buying. The fabric is suede and comes in brown (pictured) and black. Now my view with suede is that it always looks classier to go with the more natural/less dyed colour, hence the brown. What I like about this bag is that it’s quite on trend with it’s satchel styling, instantly updating the most mumsy outfit. 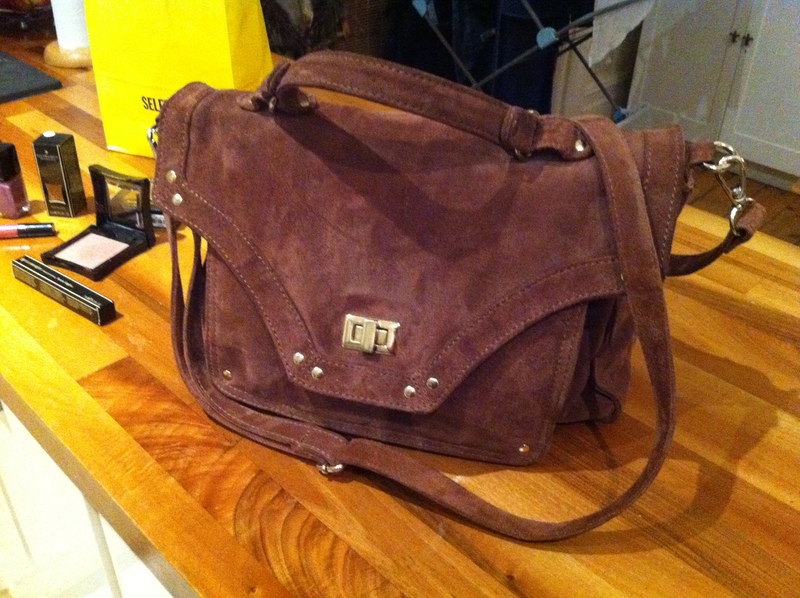 However it manages to avoid the overly structured look of a lot of leather satchels due to the softer suede fabric. It’s also incredibly roomy, without being huge, easily accomodating all the ‘essentials’. As for the price, it’s a very affordable £75. Need I say more. The longer, detachable strap makes it incredibly practical, while the shorter strap turns it into a neat little ‘clutchy’ satchel. Perfect!